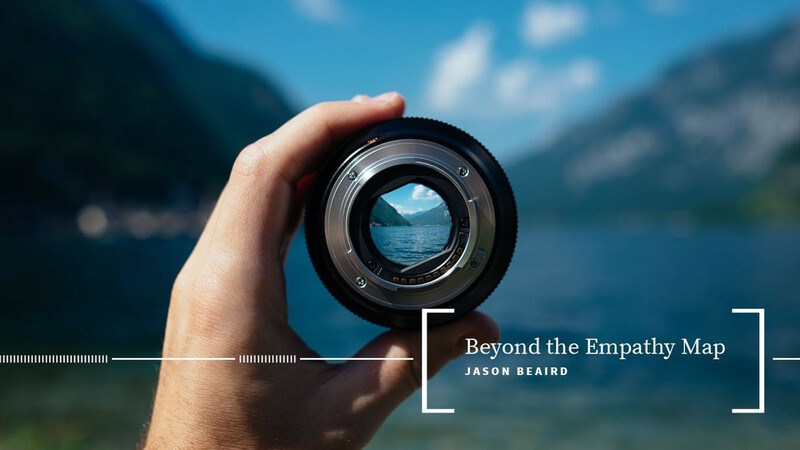 Beyond the Empathy Map Jason Beaird Theresa Wiseman's 4 Attributes of E mpathy EMPATHY VS. SYMPATHY ! " $ Perspective Ta k i n g Being Non- Judgemental Recognizing Feelings Communicating Emotion To be able to see the world as others see it. This requires putting our assumptions aside to see the situation through the eyes of the other person . Judging another person's situation discounts the experience and is an attempt to protect ourselves from the pain of the situation Just like the empathy map, we have to listen to not just our users’ words, but their emotion, the context, the scenario, to understand their feelings. Empathy isn’t just something we observe, it’s a conversation. We have to repeat back what we thought we observed to validate our assumptions. View Beyond the Empathy Map on Notist. As designers and innovators, our goal is to solve the problems of other human beings. Doing this starts with a deep understanding of our users’ true needs and motivations. Despite the best of intentions, it’s easy for us to lose touch with those users and gravitate from Human Centered to Assumption Driven Design. In this talk, we’ll explore ways to stay engaged with our users and cultivate a culture of empathy within our teams. Jason puts presentations on for free. You can too.